Howdy folks! I know, I know… its been a while since you’ve heard from me, and for that I apologize, but let me tell y’all about an awesome new (at least to me) website that the fellas at ruffian HQ stumbled upon. 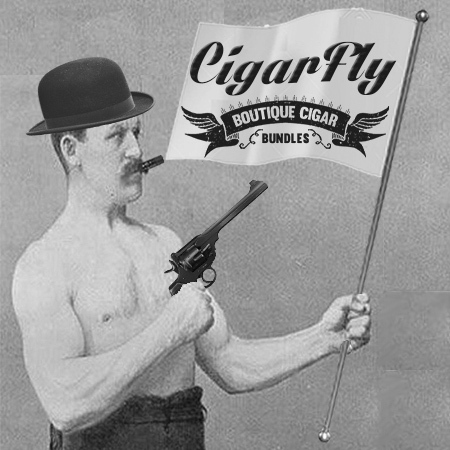 The site is cigarfly.com and let me tell ya, to me, the concept is absolutely magnificent. What they do is find out your personal taste profile by asking you about different notes that you enjoy in your cigar. The categories are fruit, sweet, spice, floral flavor, earthy tones, and strength. Once you’ve established that, you then decide which package you would like to receive, your choices are standard (35.00 USD), deluxe (45.00 USD), and premium (55.00 USD), with you receiving a pack of five cigars in any pack you choose. From there, all you do is place your order and watch the mailbox like a kid come Christmas time. For those of you that are really unsure, they also give you a cigar advisor whom is there to answer any questions or concerns you may have. I personally am thoroughly impressed with the simplicity and accuracy of this small business, you get what you want, when you want it, and the cigars are randomly selected so it broadens your horizons in the overwhelmingly vast cigar realm. The random selection kind of made me have an epiphany about the stigma of having to buy a big name brand to get a quality, enjoyable smoke. Now don’t get me wrong, they still do supply some of the big names, as well as some excellent boutique cigars.